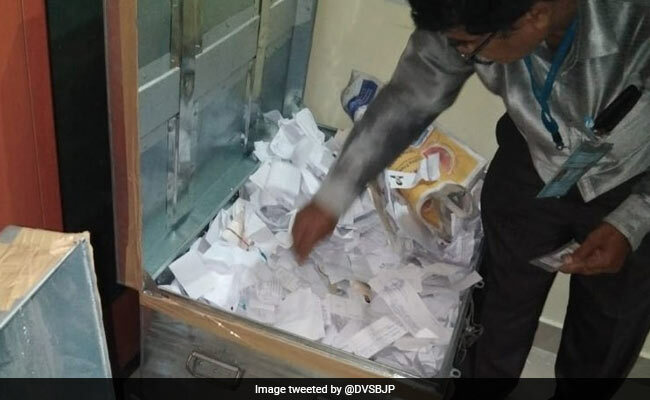 The chief electoral officer of Karnataka Sanjeev Kumar said all the reports on the case had been submitted to the Election Commission of India. Bengaluru: Two days after the discovery of a huge cache of Electors Photo Identity Cards or EPIC at an apartment in Bengaluru, police today registered an FIR naming sitting Congress lawmaker Munirathna as one of the accused. The chief electoral officer of Karnataka Sanjeev Kumar said all the reports on the case had been submitted to the Election Commission of India. Similarly, the deputy commissioner had visited the spot, gathered information and sent a report to headquarters. He said the commission would take a decision soon whether to countermand the election in Rajarajeshwari Nagar assembly constituency where the seizures were made. Declining to divulge more information, Mr Kumar said, "Every detail of the FIR cannot be shared but what you are saying (about the sitting MLA being an accused) is a fact." Asked about the recommendation he has made to the Election Commission of India, Mr Kumar said it was not something to be discussed as sharing the details would vitiate the process of decision making. The CEO said about 800 EPICs found in the apartment were verified and they were found to be 100 per cent genuine and original. "Some of them are as old as 2012, which cannot be manufactured overnight." Mr Kumar also clarified that the integrity of the electoral list was not compromised. "That can be completely ruled out because more than 800 have been thoroughly verified. There is no problem with the electoral roll," he said. The CEO said the FIR was registered under various IPC sections and the Representation of People Act-1951. Explaining the modus operandi, Mr Kumar said a systematic survey was carried out in the RR Nagar constituency of each household with photographs of voters and their houses. Details like their names, cases and even requirements like widow pension card, old age pension card and ration card was done, he said. "Systematically, it is for influencing the voters. That is very much there. That is the precise case."